On Sunday, June 3, 2012, we are hosting a spring house tour that features ten houses and two churches. All of the homes included this year have beautiful views: of the park, of the city, or of the streets where we live. Starting at Riverview United Presbyterian Church on the corner of Riverview Avenue, you will drive north to Garvin and Franklin streets then continue south to Waldorf, Baytree, and Orleans streets; finally closing the tour with visits on Oak Park, Norwood, Marshal Road and nearby Perrysville Avenue. The tour focuses on Observatory Hills architecture of the 1890-1940 period at its best. 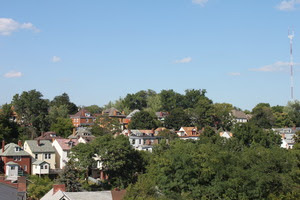 While the lower Northside’s historic district features nineteenth-century row houses, the majority of homes in Observatory Hill are detached, single-family residences. The neighborhood developed along Perrysville Avenue’s winding turns and the rolling terrain with its many hills and bluffs ultimately determined the layout of our streets. Stately Victorian-style homes were built in the neighborhood in the decade prior to 1900 when trolley lines connected Observatory Hill with other parts of the city and made living in a hillside neighborhood less isolating and more convenient for homeowners. Victorian-style homes dominated the neighborhood until around 1910, when the less ornate Craftsman or Arts & Crafts style buildings became popular. Two-story Craftsman four square and upright cottage-style bungalows were well suited to compact city lots. Occasionally one- or one-and-a-half story Craftsman bungalows were built on lots that could accommodate their larger first-floor footprint. During the 1920s American and Dutch Colonial, Tudor, and English Cottage Revival styles became increasing popular in the neighborhood. The Acorn Hill section of the neighborhood, northwest of the Perrysville and Marshall Avenue intersection, showcases an especially attractive assortment or pre-1940 Craftsman and Historical Revival styles. As you drive and walk through Observatory Hill, you will want to keep an eye out for the small, surprising details that make our neighborhood unique. Tickets are priced at $10.00 through May 31, and $15.00 on tour day.